This specialty store is only open for 2 to 3 months a year. Bitochon was approached by this client to create a website in a very short period of time so that it would be up and running during the holiday season. 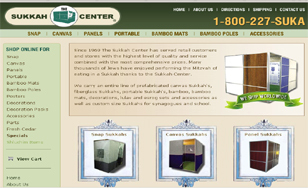 This website design enabled Sukkah Center to display product selections, including size options and available colors. To speed up the process, visitors were able to purchase their merchandise with a credit card and have it shipped immediately. The website development allows the business owner to maintain the site, changing products that need to be added or removed, without the involvement of a programmer.